On Wednesday, April 11th, 2018, artists and staff with the Sable Island Institute and the Art Gallery of Nova Scotia’s (AGNS) ArtsSmarts Nova Scotia program visited Atlantic View Elementary school in Lawrencetown, for a fun day of Sable Island-themed art-making. 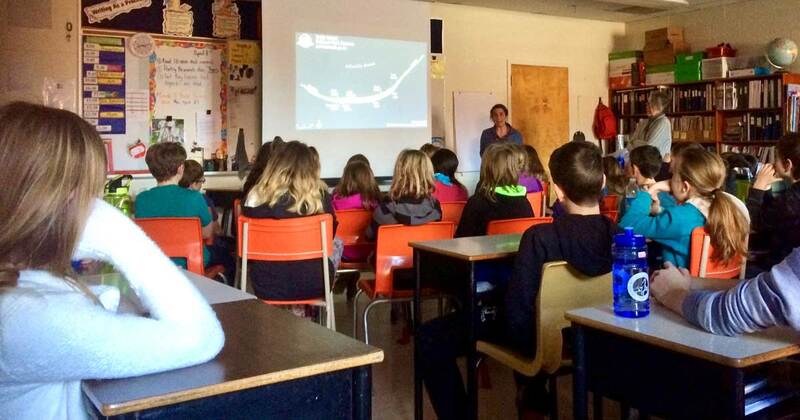 Painter Susan Tooke and filmmaker Dominique Gusset of the Sable Island Institute gave a presentation about the Island, and brought natural materials and examples of beached plastic litter collected on Sable Island by researcher Zoe Lucas. 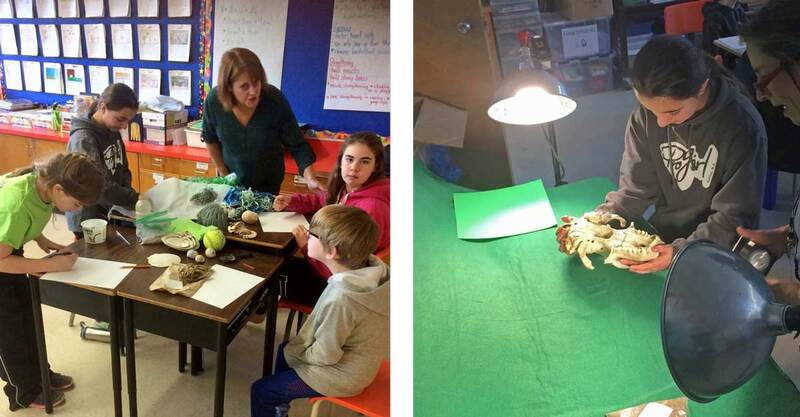 Following the presentation, the grades 4-5-6 students had opportunities for hands-on investigation and discussion of artefacts found on the Sable beach—including skulls and bones from horses, seals, and a harbour porpoise, a variety of shell, crab and sponge specimens, and manmade litter items ranging from tangles of balloons and ribbons, to a note in a plastic bottle. The creative potential of both natural and litter items was explored during a drawing and photography workshop involving manipulation of these materials through magnification, sketching, and rubbings of surfaces, and combined with photographs, to create artworks. AGNS Assistant Curator of Programs Kris Webster and Gallery tour guide Pam Evans also assisted with the presentation and art-making activities. This was phase one of a two-year ArtsSmarts Nova Scotia project, which will continue at the school this fall. The Sable Island Institute welcomed the opportunity to be involved in this program. The Institute’s mandate includes development of public outreach and school programs that provide access to physical resources in our collection through multidisciplinary activities/workshops and interpretive services. ArtsSmarts Nova Scotia is operated by the Art Gallery of Nova Scotia, with support from Arts Nova Scotia and the Nova Scotia Department of Education and Early Childhood Development, to develop, fund and promote our cultural resources with school communities throughout Nova Scotia.